Fishing kayaks are better than fishing boats in many scenarios, and that’s a fact. They simply offer more options and can be customized, adjusted to meet any requirements you may have based on what and where you’re fishing. If you’re a fisherman in need of a kayak, feel free to browse through our selection of the best fishing kayak’s. The diversity of fishing kayaks is virtually palpable – each brand makes different models, so categorization is nearly impossible. Regardless, there are a couple of things you could want to take into account. First of all, don’t pay too much heed for the price. If you see an overpriced model, there’s bound to be a certain reason why that is so. On the other hand, cheap models are usually good for beginners, so just skip them if you have any experience whatsoever. Secondly, choose your kayak in accord to your preferred fishing posture – if you like to crack open a cold one and sit through the process, smaller (read – not-as-stable) kayaks will do the trick. Alternatively, look for kayak models that feature a wide base. Thirdly, there are fishing kayaks which come with a set of fishing rod mounts, and there are those that don’t. If your fishing accessories include any alternatives, this shouldn’t bother you too much – however, we’ll always recommend a kayak with rod holders rather than a model which doesn’t have any. Furthermore, try to avoid flimsy kayaks at all costs. It’s pretty easy to discern them from sturdier models, as each review describes the features (and build material) of the kayak in question. Lastly, don’t forget that you’ll have to haul your kayak to your fishing spot, or at least to the shore. That means that carry handles are absolutely necessary unless you intend to bring a crew of several people and carry it to the shore the old-fashioned way. Let’s open up our review of the best kayaks for fishing with BKC’s UH-RA220. Generally, Brooklyn Kayak Company is among the world-class leaders in the fishing kayak industry, and it’s safe to say that most veteran fishermen have at least one of their amazing products at home. Now, as far as UH-RA220 is concerned, you’ll notice that it’s not an average entry-level fishing kayak. It costs quite a bit but boasts a substantial value for the cash due to exceptional performance and a beautiful outward appearance. It’s characterized by an exquisitely stable platform, waterproof storage, and an onboard cargo area for easy transportation of your necessities. Overall, UH-RA220 is very beginner-friendly, as it comes outfitted with a set of carrying handles, it’s not overly and unnecessarily bulky, and it’s not too heavy (although it’s not too light either). First of all, BKC UH-RA220 comes in five color variations – the blue, camo, green, grey camo, and red/yellow. Each of these color options looks amazing, although camo variants are, perhaps, better suited for fishing – the blue and red/yellow ones are too stingy on the eyes. 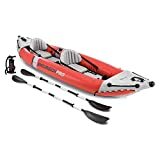 This kayak comes supplied with three-rod holders, two flush-mount holders, and a single adjustable rod holder, which totals in six-rod placement positions. It’s a stable platform like we’ve previously mentioned, which means that you can even stand upright while fishing without having to fret about falling over. The aforementioned waterproof storage features a set of elastic straps that you can use to easily transport larger items, making it extremely convenient for larger fish storage. Lastly, the carry handles are equipped on both sides, making it extremely easy to carry this kayak in and out of the water. First of all, UH-RA220 excels in numerous fields of performance – it’s beautiful, stable, and has plenty of room for up to six rods. That makes it a bit more versatile than most standard fishing kayaks, and that’s just a start. The storage is completely waterproof and rather spacious, which means that you’ll have plenty of room for both your necessities and caught fish. 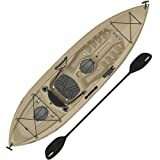 If you have some experience with fishing kayaks, you’ll find much value of this kayak, as it has all the features a fisherman needs to fish day and night without a worry on the mind. If we’re to overlook the price of Brooklyn Kayak Company’s UH-RA220, it would be nearly flawless. Even though we’ve mentioned that it’s not too heavy or light, UH-RA220 tends to sit a bit lower in water when compared to similar fishing kayaks – it might be the storage or the key points which help with the balance that are pulling it a bit downward, but this is certainly not a deal breaker. Since we’ve already mentioned who Brooklyn Kayak Company are, let’s get straight to their second model in this review – the UH-FK184. The most notable characteristics of UH-RA22 are listed above, so if you didn’t manage to memorize them all, glance back and buckle up for a bit of comparison between the two. The UH-FK184 is a bit smaller than UH-RA22, the former being 9-foot tall and the latter 11-foot. This particular model features five-rod holders, whereas the RA22 can hold up to six, and this one comes in more selectable color variations. Apart from that, the same technologies were used when manufacturing both of these models, hence there are bound to be certain similarities between them which we’ll point out and highlight in the sections below. The BKC UH-FK184 excels in aesthetics as much as the first model in our review – the UH-RA22. You can choose between blue, desert sand, pink, grey camo, red/yellow, army green camo, and yellow/orange color variations. The total of five-rod holders includes four flush-mount holders and a single articulating-fishing rod holder, which is substantially and functionally different when compared to RA22. As for the similarities, both of these models feature a large and spacious waterproof cargo area and a secure set of paddle parks. Further on that note, the same set of carry handles on each side are outfitted to this model as well. We mainly recommend BKC UH-FK184 to fishermen who liked the concept of UH-RA22 but found it as too expensive. This model comes at a bit more approachable price and allows you to benefit from similar advantages that RA22 would offer you. 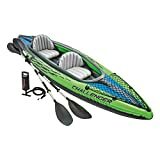 Even though this fishing kayak is smaller than RA22 (which is 11-foot tall), it’s still pretty large, and comfortably spacious for up to two adults to fish in it. The only thing we didn’t find as particularly good regarding the BKC UH FK184 is the seat. It’s quite okay, but it’s far from being as comfortable as the one outfitted to RA22. Other than that, this kayak is pretty valuable for the price. Sun Dolphin’s Journey fishing kayak is basically a longship-style kayak with plenty of leg room. It looks pretty plain and comes supplied with all the necessary fishing accessories and features. There are plenty of things that are awesome about its performance and but a few downfalls that aren’t necessarily deal breakers. First of all, Sun Dolphin’s Journey comes in sand and olive color options. Both look rather straightforward, so if you value aesthetics above all else, feel free to skip to our next pick. This kayak is equally good for both lake and river fishing as it features a long, thin hull. It’s 12-foot tall, making it the tallest kayak in this review so far. Despite its somewhat crude outlook, the Journey is actually quite lightweight (approximately 45 pounds) for a kayak. Furthermore, its weight doesn’t impede upon its stability whatsoever. There are two flush mounts, as well as a single swivel-fishing rod holder, totaling in three-rod holders – again, this is quite basic, but enough for a single adult. A portable, lightweight kayak such as Journey will significantly expand and improve your fishing experience. It’s pretty neat overall, and it doesn’t cost too much. Apart from that, people who value simplicity would benefit the most from it. Being 12-foot tall, Journey is quite tall, even by fishing kayak standards. That also means that there’s plenty of room for your legs and unused rods. The portable accessory compartment can be found at the back of the hull where you could store your necessities. The first thing that most people don’t like too much about this kayak is the number of rod mounts. It features a total of three fishing rod mounts which isn’t too bad, but most veteran fishermen need at least four, or even more. Apart from that, the Journey doesn’t particularly excel in aesthetics – the color is quite neutral (both sand and olive variants), and the Sun Dolphin logo is the only graphic content on it. Again, this is not a deal breaker, and it could even be considered as a pro if you like things plain and simple. We’re looking at a big, moderately expensive “hunter” fishing kayak from Vibe Kayaks. This particular model brings a lot of benefits to those who’re willing to pay top dollar for it, so there are only two things that should interest you for the moment – it’s quite expensive, but it’s certainly worth the buck. As for the brand itself, Vibe Kayak boasts a large catalog of premium-quality kayak’s, fishing gear, trinkets, and accessories. Even though most of their stuff are entry-level, they’ve pulled a lot of weight by introducing a moderately pricey product in their assortment. Since it has a lot of proving to do, let’s see how it fares in our performance checks. First, it’s important to accentuate the beauty of Vibe Kayak’s Skipjack. This kayak simply looks amazing however you put it, but you’ll be able to choose between three color/style variants should the initial color not suit your preferences. There’s the blue camo which looks quite neat but appears kind of plastic when compared to the original true hunter camo. Lastly, there’s the sea breeze which is vivid and, perhaps, bright. Regardless, it’s safe to conclude that this kayak excels in aesthetics. The fact that this kayak comes outfitted with a single seat tells us that it isn’t exactly suitable for more than one person, although there’s quite a lot of space – the exact dimensions are 9 feet of length and 46 pounds of weight (when completely unloaded). You’ll be able to mount up to four rods, and that’s excluding the bonus accessory mount, so we could count it as the fifth – that’s awesome in general, but pretty mediocre given the price of this kayak. Furthermore, you’ll be able to use two sealed hatches for storage. Essentially, this is a premium-quality fishing kayak – it does cost quite a bit, but the advantages it provides are more than enough to compensate for the steep price. It’s versatile, extremely stable, and looks pretty great. All things considered, people who have some extra money saved up should definitely consider it – the Skipjack is not only worth the money, but you’ll soon realize that it glides above water with greater ease (due to the exquisite design), it’s pretty light when unloaded, and it doesn’t take up too much space when you’re not using it (only 9 feet long). In all honesty, finding that one person who had a remark on Vibe Kayak’s Skipjack was plain difficult. The reason for that is simple – people love this kayak as it offers and provides everything a fisherman needs. The only thing that’s not as appealing is its price – anyhow, that’s hardly a flaw, but it could be a deal breaker if you’re looking for a budget fishing boat. For the sake of diversity, we’ve added a neat little kayak that’s not shamefully cheap, but decently affordable (to say the least). Sun Dolphin’s kayaks are great, all things considered, which we’ve already seen with their “Journey” in the sections above. Now it’s time for “Aruba” to prove what it can benefit you. Essentially, one of the best things about Aruba is that it comes in a plethora of colors. Apart from that, it’s very easy to carry and store it when not used, but there are no fancy features that most high-end and boutique level kayaks come outfitted with. Regardless, this particular model holds a superb value for the money, and we hope that you’ll share our impressions after this review. Despite its rather small outlook, Sun Dolphin’s Aruba might just be the best kayak for fishing in the medium price point category. It comes in seven color variations, including blue, citrus, lime, ocean, pink, red, and orange. All color styles are rather plain and straightforward, so the color is basically there for aesthetics (whereas some models benefit from camouflage – the so-called “camo” styles). The cockpit is relatively large and spacious enough for you to rest your legs and back. What’s more, the seat is padded and offers plenty of back support. Just behind the seat, there’s a convenient gear compartment outfitted with a shock-cord deck rigging. The foot braces are fully adjustable – a bit of customization potential is always a plus with kayaks. There are two things you’ll like about Sun Dolphin’s Aruba (which we can guarantee). The first is the simple, straightforward design – you don’t have to bother with fancy hooks, loops, straps, and similar gadgets, as this kayak doesn’t come with any. That makes it absolutely ideal, and perhaps, the best kayak for fishing if you’re a complete beginner. Secondly, it looks very good, and you’ll be able to choose from a total of seven colors. That might not mean much, but again, beginners should feel comfortable in and out of their kayak – while pros and veterans pay more attention to details, beginners shouldn’t worry too much about it, rather just consider if you look what you see. Lastly, some folks think that Sun Dolphin’s Aruba comes cheap, others say that it’s “moderately affordable”. The truth is somewhere in between, though, but it certainly doesn’t cost too much. A plain kayak can only get you so far – you’ll be able to cruise in your little Aruba, catch some fish, scurry back to the shore and pack it up with no significant effort. However, it remains to be seen whether you’ll be able to stand upright, as the cockpit, no matter how spacious, doesn’t seem stable enough to support a standing person. The only thing that might be considered as a deal breaker for fishermen with some experience is the lack of fishing rod mounts. Namely, what you see is what you get, and this kayak will only grant you the opportunity to store your necessities in the cargo area, but no rod mounts are outfitted to it. Perception – we’re talking about a brand, rather than a set of skills required to observe something of value. However, you won’t need the latter to conclude that Pescador Pro from the aforementioned manufacturer holds a huge value for the cash. This is, basically, a boutique-level kayak which costs quite a bit, but it’s among the best kayak models for fishing – there are plenty of reasons that could back up such a bold statement, among which we’ll state the most important ones in the sections below. First of all, Perception’s Pescador Pro features a premium-quality polyethylene hull – a durable shell which is impervious to all sorts of damage. The seat is fully adjustable and could be placed in one of the two positions (front or back). Furthermore, the foot brace is also adjustable, allowing you to achieve the best paddling posture. Secondly, the stern tankwell is molded, and it features several bungee keepers. There’s a second tankwell on the bow which features mesh cover and offers plenty of spacious storage space for fishing gear and additional accessories. There’s even a section of midship recesses and an additional box storage (which, sadly, can’t hold larger fish). Make use of the dual molded rod holders, which when combined with the YakAttack Trac system gives you plenty of customization options to attach numerous fishing, as well as paddling accessories. Perception’s Pescador Pro is one of the best kayaks for fishing you’ll find if you’re a professional fisherman. It simply has it all – the space, the beautiful outlook, durability. There’s also plenty of room for your gear and accessories, and to top it all, you can use the YakAttack Trac system to attach any number of trinkets on your Pescador. One of the best things about it is that it features a massive storage compartment – better yet, several of them. All cargo holds are well positioned, allowing you to have everything you need within a hand’s reach. Essentially, people who are willing to pay top dollar for the Perception’s Pescador Pro will find it as flawless. However, not all people have so deep pockets as to perceive this kayak as valuable, as it costs a fortune. The second thing that can be considered as a flaw, but not as a deal breaker, is the length of this kayak. It’s 12 feet long, maybe several inches on top of it, so you’ll also need to have a large storage space for it when you’re not using it. Apart from that, everything seems to be in check. Now, if you liked Perception’s Pescador Pro, you’re going to love the Pescador Pilot edition. Basically, there are a lot of similarities between these two professional fishing kayak models, but there are a couple of very important differences between them as well. You should note that, much like Pescador Pro, Perception’s Pescador Pilot is a professional kayak which is absolutely ideal for veteran fishermen. It comes outfitted with bleeding-edge technology and some of the finest features known to man, so if you’re prepared to pay top buck, make sure to not miss out on our review. Plainly put, Perception’s Pescador Pro might be the most expensive model in our review, but it’s certainly the ultimate, best kayak for fishing you’ll ever find. There’s not a thing about it that doesn’t scream and yell “quality” all over, and the level of craftsmanship is entirely unprecedented and unparalleled. That being said, let’s begin with its design. Much like the Pescador Pro, Perception’s Pescador Pilot features a 12-inch hull made of exquisitely durable composite materials. There are three vivid color variations at your disposal, including moss camo, sonic camo, and sunset, all of which excel in aesthetics without fail. The storage areas are very spacious, and it’s safe to say that you won’t find yourself in need of more space. There’s a neat compartment in front and a rope-strung cargo area in the back. Now, let’s run over the highlighted differences between the Pescador Pilot and Pescador Pro. First of all, this is a pedal-driven kayak. It means that you won’t have to bring along any paddles – these do not only fatigue the fisherman but scare the game away as well. Simply kick back in the luxurious, highly comfortable seat and pedal your way through your watery hunting ground. Secondly, and this might be a bit of a downfall, Perception’s Pescador Pilot doesn’t feature any mounting spots. You’ll have to hold your rods manually or make use of the rod mount accessories (which are, of course, sold separately). Lastly, note that Perception’s Pescador Pilot isn’t just for anyone – it costs a small fortune, and only veteran and professional fishermen would really be able to utilize all of its many features. Perception’s Pilot is the perfect fishing kayak. If we’re to overlook the price part, it’s practically flawless. Choose from three vivid color variations, relax with the pedal-driven method of operation, and take your fishing to a whole new level. Basically, even though Pescador Pilot is nearly flawless, we think that there are a couple of things that could’ve been done differently. Firstly, the price is a bit steep, even for professionals. Of course, if you’re making thousands on a monthly basis, investing in a powerhouse kayak won’t fall too hard on your budget – that, however, does not apply to the vast majority of fishermen. Secondly, and lastly – this kayak doesn’t feature fishing rod mounts. That, however, could be overlooked if you have the necessary fishing accessories – all of which you can safely store in one of the two spacious cargo areas when you’re not using them. Sevylor Coleman is one of those brands on which you can rely on when you’re in need of high-quality fishing accessories. Their catalog of fishing kayaks is, however, a bit narrow and small, but the offers are simply too great to refuse. We’re reviewing their flagship model, and we hope you’ll like what you see. Essentially, this is the first inflatable kayak for fishing we’re reviewing. It inflates rather quickly and takes a couple of minutes to reach full size, but that’s not even the best part. There are some people who think that inflatable kayaks aren’t as durable, hence not as reliable as composite ones – we beg to differ. This kayak features 18-gauge 1000D PVC material, which makes it almost completely impervious to ripping and tearing. It’s easy to repair it due to removable air balloons, and it could easily become your favorite side kayak for fishing. The accessories onboard include two adjustable seats, four trolling rod holders, two vertical rod holders, and two double-side oars, as well as the foot pump, a repair kit, and a convenient carry bag. First of all, this kayak doesn’t cost too much. Apart from that, it’s easier to repair it than a composite kayak which would be rendered useless by serious bumps. What’s more, you’ll even get a repair kit so you could patch it up on the go. Secondly, you’ll benefit from a total of six-rod mounts and get a hefty set of complementary features – the much-needed fishing accessories are all contained within this premium bundle. Lastly, it’s easier to carry an inflatable kayak than it is to haul a conventional one. Inflatable kayaks are meant for peaceful waters. People who intend to go fishing in murky, dangerous waters shouldn’t even consider it, regardless of how cheap it is. All things considered, this is, perhaps, its only flaw. Bonafide’s SS127 fishing kayak is the latest letter in technology – this is the kind of stuff you’d normally see in a sci-fi movie, as you’ll come to realize as soon as you take your first look at it. Now, it’s a very expensive kayak, and most people would ask “is this actually worth the money?”. We’re here to find out. The SS127 is a beautiful, maybe a bit scientific-style fishing kayak. It features a high seat, which allows for an enhanced view and superb comfortability. It’s loaded with a plethora of fishing accessories, including a storage drawer, a DryPod, several rod holders, traction pads, a bow hatch, and lots and lots more. Now, the hybrid hull is what makes it unique when compared to other fishing kayaks, but it’s certainly not just for show – this type of hull provides additional stability, improves the paddling efficiency, all the while boosting the overall speed of the kayak as well. If you’re looking for a versatile fishing kayak, you’ve found one. Bonafide’s SS127 kayak comes in several colors, it excels in aesthetics, and it comes laden with a plethora of bonus accessories. What’s more, even though it’s quite bulky, it’s very stable and can reach some serious speeds with ease. The only problem with boutique-level fishing kayaks is that they cost quite a lot. Bonafide’s SS127 is not an exception, although it does boast a huge value for the money. Apart from that, the steep price makes it suitable for extremely dedicated fishermen, leaving beginners out dry of such an option. The last fishing kayak in this review comes from Vibe Kayaks (just like the Skipjack). Basically, this is a mid-priced kayak that comes supplied with top-shelf features, much akin to those which boutique-level kayaks are outfitted with. The Yellowfin isn’t exactly yellow – namely, you’ll be able to choose between Jam Berry, moss camo, and sunset color options. 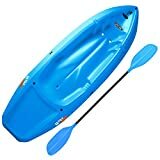 It was designed for a single person, it’s 10-foot long and 57 pounds heavy (which is pretty light when compared to most fishing kayaks). There are four capped mount holders and an adjustable footrest – all you need to leisurely enjoy your fishing all day long. There are a few storage options you can use – the main hatch is sealed and feature bag inserts, but there are also two tackle-tray holders, as well as a large bungee tank in the rear. Regardless of the price, Vibe’s Yellowfin is for people who won’t settle for budget fishing kayaks but don’t have the money to afford the most exclusive models. It’s pretty versatile, and using it comes rather comfortable. Apart from that, it’s supplied with an expanded list of necessary accessories, and it’s sure to make your fishing trip an eventful one. The only thing that needs a bit of improvement is the seat – it’s quite flimsy, and even though it will last for quite a while, it might break down after a couple of months. All things considered, the only real problem people have with the Yellowfin is that it isn’t exactly cheap. People who are looking for the best kayak for fishing have come to the right place. Our review of the best fishing kayaks feature all sorts of models, ranging from budget options to some of those more expensive ones. Regardless, we dare to think that our catalog has everything for everyone both beginners, veterans, and professional fishermen, so just kick back, relax, and take your pick.